While not quite as hard-hitting as its knockout predecessor, Creed II is a heavyweight contender in its own right and among the stronger entries in the Rocky franchise. Steven Caple Jr.’s sequel to 2015’s Ryan Coogler-directed Creed is part quasi-sequel to 1985’s Rocky IV, which pit champion boxer Rocky Balboa (Sylvester Stallone) against ferocious Russian boxer Ivan Drago (Dolph Lundgren) to avenge the death of Apollo Creed (Carl Weathers). 33 years later, Apollo’s illegitimate son, Adonis ‘Donny’ Johnson Creed (Michael B. Jordan), has emerged as a champion under the tutelage of Rocky. While navigating domestic duties and new responsibilities outside of the ring to fiancée Bianca (Tessa Thompson), Donny faces the showdown of his life when dangerous fighter Viktor Drago (Florian ‘Big Nasty’ Munteanu), son of the disgraced Ivan, issues a challenge Donny is unable to refuse. “You got everything to lose. He’s got nothing to lose. When a fighter ain’t got nothing to lose, he’s dangerous,” warns Rocky, refusing to train a vengeance-seeking Donny and repeat mistakes of the past after failing to halt the fight that claimed Apollo’s life. After going the distance and breaking free of his late father’s shadow in Creed, a rattled and obsessed Donny must now defend his own legacy as he comes to discover what he’s truly fighting for — his newfound family or the stolen father he never knew. 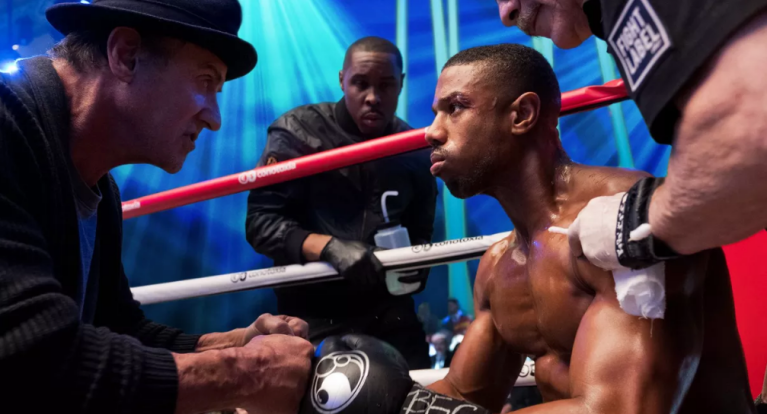 A strained relationship with a little-seen Rocky removes the biggest engine that steered Creed, forcing Creed II to mostly stand on its own and go toe-to-toe to prove itself a viable standalone franchise that is more than just a Rocky spinoff-slash-reboot; the same way Donny has had to twice face the reckonings of the past and prove himself his own man. Despite the plentiful Rocky legacy permeating throughout Creed II — from familiar faces and locales to lingering themes and threads, down to the “Creed v. Drago, round two” title match — the sequel carves out its own name for itself and does so handedly, even if longtime fans will recognize story beats borrowed from Rocky II, Rocky III, and Rocky IV. Tethered by powerhouse performances from its three leads — Jordan, Thompson, and Stallone — Creed II trades in the punchier parts of its predecessor for a more character driven and drama-focused dig into what it means to be a fighter inside and outside of the ring. What follows is a rousing training montage and a crowd-pleasing, cheer-worthy final fight — the true indicator of any successful Rocky/Creed movie — bringing with it a satisfying conclusion not just to Creed II, but potentially the 43-year saga as a whole. If Creed II is the last fight for the Rocky franchise — as suggested by its misty-eyed denouement, coming across as more of a franchise finale than just a movie wrap up — the saga goes out on top. REVIEW — "Ralph Breaks the Internet"
BLU-RAY REVIEW & GIVEAWAY — "Crazy Rich Asians"